An architect conceives beautiful and functional building designs. He or she has the unique ability to “see” landmark structures before any physical manifestation happens. However, to the people building the masterpiece, the concept needs to be explained and details need to be vetted. Otherwise, costs can escalate for the wrong reasons. The built environments that make people feel good; where work is productive and life is comfortable should not be constructed without a working model first being created. Prior to the ability to accurately model these environments, much was done by trial and error with less than stellar results because overlooked details by the architect or builder had to be left uncorrected due to the cost of correcting them. Now with the practice of modeling, these details and potential errors can be discovered early in the process and worked out well before any material is ordered or cut. Custom architectural metal work is one of the toughest components to get right in any new or renovated building. 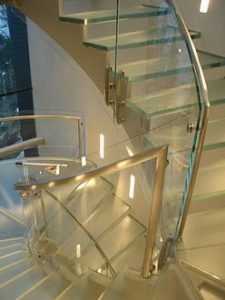 What we’re talking about here are feature elliptical stairs, intricate rails, highly customized and stylized structural areas and ornamental metal work. Herein the modeling process is absolutely crucial to aid architects and construction managers to 1) know the design will work and 2) show the fabricators and builders exactly what they need to do to complete the project successfully. A carefully planned and “constructed” model of a feature stair, for example, will not only help the fabricator, but guide the builder and other trades so that everyone is working from the same set of instructions. For any complex architectural metal project, it is best to begin the modeling process very early, even as early as design conception. As the architect envisions a new project, his creative ideas may flow freely and a flash of brilliance may emerge. Perhaps a grand arched entrance to a lobby with an ornate set of metal stairs leading to a mezzanine is envisioned. Perhaps the artistic vision is such that it borders on bucking the laws of physics using available construction technologies. There he needs to stop and ask: can this be built safely and within budget? At this juncture, a metals expert with the ability to create an accurate model of the project should be called in. The modeling process takes the architectural drawings and renderings to the phase of concept testing or prototyping. Having a total understanding of how metal is fabricated, welded, formed and assembled, the metals expert can create a digital model simulation. This will determine the feasibility of producing the fabrications and integrating these complex, sometimes ornate building components into the superstructure. 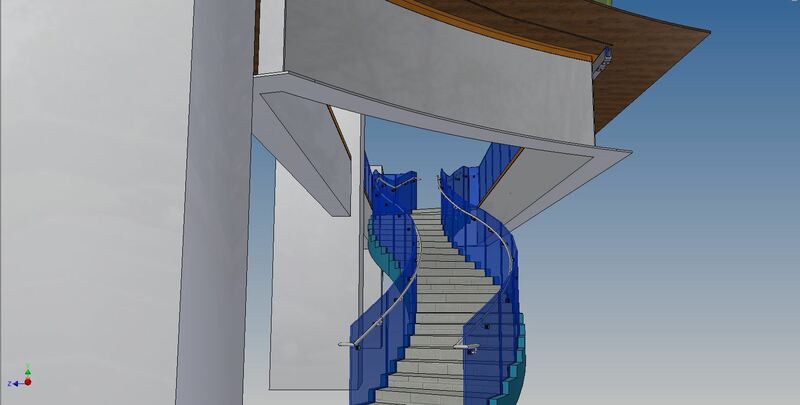 Such complex and difficult projects require accurate modeling and detailing for the builders to convert them with materials and labor into the real thing – such as beautifully curved stairs with congruent ornamental rails. We’ll offer a relatively straightforward example. 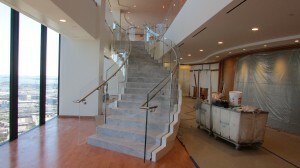 Following are the modeling images and pictures from a feature stair on the 58th floor of a Boston building. While the model was able to vet out the architects design and show that the engineer’s needs were met, we were also able to use the most up to date fabrication techniques to control the fabrication costs and ensure that the 3,000lb sections would fit in the freight elevator. Click for full detail large image. While small adjustments needed to be made along the way for onsite conditions, these adjustments were made and easily handled by the general contractor and other affected trades well within budget. It was the model that allowed the fabricator and construction team to install these feature stairs without even a hiccup! The metal and glass went in smoothly and exactly as intended.